Patricia “Pat” passed away of natural causes on February 6, 2019. She was born in Hollywood, California June 14, 1928, but grew up in Elkhart, Indiana. She attended Indiana University where she studied psychology, was outgoing as always, loved by all and in 1948 elected homecoming queen. During her early days as a working woman she had a daily radio program for women on WAMS Radio, and a column for the Salem Sunbeam, writing an article under the pseudonym Sally Says. 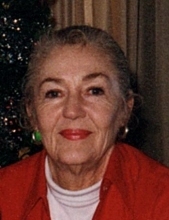 She met her husband Harry in Las Vegas and they settled down in the Gallatin Valley in 1963. July of 1969 the family moved out to the country to the "Funny Farm" as Pat was fond of calling it. Pat enjoyed tennis, skiing, sailing, bridge and most of all hugs. Her smile always lit up a room and she cheered others up just by being with them. She is survived by her sister Elizabeth; three sons David, Steven and Charlie; granddaughter Ashley and Suzie, Ashley's mom. Pat will be dearly missed, and she would ask that each of you remember her for her smile, her often impromptu love just when you needed it and to celebrate her life with friends by having a bite of chocolate, desserts with lots of icing and most of all giving each other a hug. In keeping with Pat's wishes there will be a private family remembrance. To send flowers or a remembrance gift to the family of Patricia Cullen Noel, please visit our Tribute Store. "Email Address" would like to share the life celebration of Patricia Cullen Noel. Click on the "link" to go to share a favorite memory or leave a condolence message for the family.